Export packaging demands the expertise and experience of partners who understand that millions of dollars in product – and priceless brand reputations – are loaded aboard ocean transports every day. ARMOR people and VCI products protect products and brands. Temperature and moisture conditions around ocean transport are exceptionally harsh and ideal for corrosion development. Your customers rely on you to bring products to their appointed destinations in ready-to-use condition. Our clean, safe and easy VCI products allow you to dry ship (without oil and grease) and they protect products against the robust, harsh environment of the ocean. Cost – Shipments that arrive at their destinations with corroded and rusted parts equate to loss of time, money and human resources. Performance – Products that have been protected from corrosion perform better. 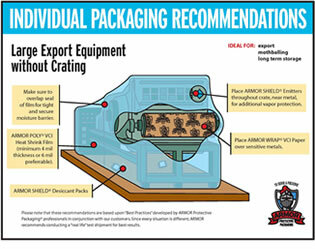 ARMOR products and personnel are your key to export packaging success. Contact us today to begin your journey with ARMOR.